If you look around today, people have an incredibly wide range of communication choices that can generate a lot of distractions. If you really want to communicate effectively with people, email is probably not going to be very efficient. Personally, I probably have more than 500 unread messages sitting in my inbox right now. What was effective 10 years ago is no longer effective today, simply because people just might not read email; they might read their Facebook news feed instead. This is one reason why digital signage is so useful today in keeping content fresh and meaningful to their audiences. A visual message and keeping it fresh are critical. We’re sitting on mountains of data, and the goal is to create information that keeps people interested. Here are some considerations for harnessing that data to make your digital signs and displays strategies work for you. Digital displays are content-driven systems. Without the content, all you’ve got is a screensaver. Formulating a content strategy is the most important aspect and the starting point for any marketer or communications professional. It’s similar to building a website. If you don’t have compelling content to put on your webpages, you don’t provide any reason for readers to engage. Developing relevant content can be a daunting task since it needs to be appropriate to all viewing audiences. For example, if you’re a national retail organization, there may be regional factors that need to be addressed in your digital signage strategy with unique messaging requirements in local environments. You also have to think about keeping your content fresh and current. It’s like having a television channel that plays the same episode of “Friends” or “Seinfeld” over and over again, “not that there’s anything wrong with that.” Of course, some people want to watch that channel every day, but eventually most people will lose interest and change the channel. By visualizing your data, such as HR databases that have employee photos or CRM systems like Salesforce, your signage systems can continuously display meaningful information that command attention in a broadcast-quality medium. And you’re not only creating incredibly relevant communications, but you’re extracting added value from systems and key performance indicators you have invested in. This dynamism can help solve the problem of data deluge, similar to what you might have in your email inbox right now. Like me, you probably are finding it’s a difficult task to go through every message and absorb all of that information. The goal here is to understand that the system harnesses information from multiple data sources and can broadcast content in a compelling style. This way the information becomes meaningful and is delivered in a timely fashion. The key consideration to understand with mobility is that businesses want to enhance an end user’s experience in every interaction—digital signage included. For example, using tablets for assisted selling in a retail environment. 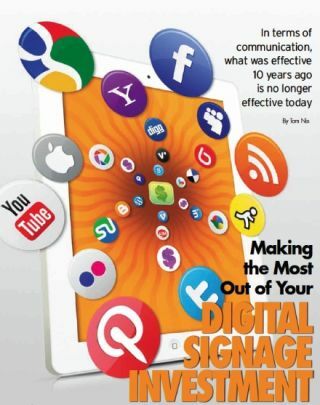 Many organizations today are wondering how a small sign like an iPad or an Android device can integrate with their digital display strategy or how digital displays connect to their mobility strategy. People are increasingly accessing digital content on mobile devices rather than standard computer browsers. A natural extension will be individuals using their smart phones to interact with digital signs and displays to get more information, product coupons, reviews and more. Self-service kiosks are gaining popularity at an increasing number of points of decision, such as grocery stores, hospitals, hotels, movie theatres, quick-service restaurants, transportation hubs and tourist attractions. Many people prefer kiosks over other transaction options because they are faster, easier and can deliver more accurate services in addressing their needs. And companies view kiosks as a way to avoid rising labor costs or as providing an opportunity to boost service levels in tight labor markets where it may be difficult to add employees. The key to a successful kiosk is in line with other forms of digital signage. Organizations need to present visually compelling graphics and associated content to highlight products and services, and make recommendations as calls to action. As a naturally interactive medium, kiosks present the opportunity for an organization to collect valuable business intelligence, which in turn can lead to better messaging based on client behavior. Analysts predict that by next year more than 50 percent of digital content will be accessed on mobile devices rather than standard computer browsers. In a retail environment, customers will increasingly use their smart phones to interact with digital signage to get coupons, product information or reviews. Another option is to use on-site display content to invite visitors to “check in” through an application like Foursquare. This can encourage repeat visits through various perks, such as naming a visitor “Mayor” and displaying his/her name and face on-screen for friends and family to see. Twitter also has a key place in a digital signage strategy, encouraging retail or restaurant customers to tweet about their favorite products or menu items. This can help a company feel more local as it engages customers and increases their dwell times, which in turn can lead to additional purchases. Especially in retail environments, predictive analytics technology leverages the data you already own to predict and deliver the optimum sales message to your customers with point-of-sale immediacy. Predictive analytics transforms historic market data and live third-party data streams into marketing messages that positively impact buying behavior so you will know what your customers want to buy before they do. This allows you to easily distill past patterns and transactional data to anticipate future consumer behavior that may not be immediately obvious. In terms of digital signage, predictive analytics can help organizations focus their content strategies based on a set of studied variables. For instance, a retailer might use digital signs to display weather conditions. For example, if it is raining, the content could nudge customers to buy umbrellas. In this sense, with predictive analytics, content can be driven to grab customers’ attention, engage them with immediacy and interactivity, present multiple streams of information on one or a series of displays—all while constantly changing messages to match the location, the time of day, the weather or even the individual customer in front of the screen. It allows you to target the ideal message to the right customer at the precise time in the perfect place. Taking this scenario one step further, some organizations are now combining their digital signage hardware and software with video analytics technology, which can aggregate anonymous data about the number of people viewing a digital sign, their average duration of attention and even their genders and age brackets. This approach is helping them gauge the effectiveness of their digital signage content and make changes based on who is viewing a screen at any given time. Today, organizations of all sizes are using digital signage solutions to effectively reach their target audience. Digital signs have evolved from being simple posters with one-way communication to an interactive experience with two-way communication. The ability of the technology to connect to multiple data sources to gather content provides the flexibility organizations need. These features add to the versatility of digital signage and enable it to inform, influence, provide direction, reinforce branding, track key performance indicators and yield many corporate benefits, as part of a highly impactful interactive communications strategy.